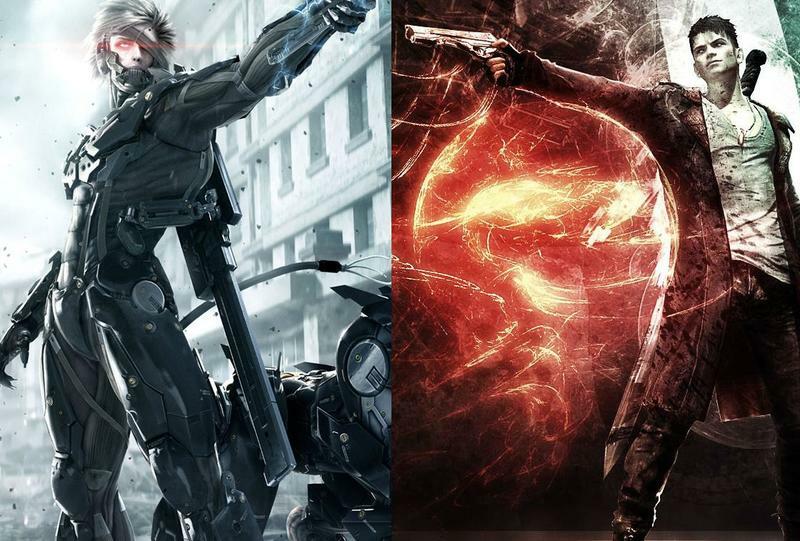 Metal Gear Rising or DmC Devil May Cry? Hack n' Slash Throwdown! It almost slipped past me, but we are smack dab in the middle of a good old fashioned genre rumble. Two classic companies have positioned their winter hack n' slash games all primed up to compete with one another, and only time will tell who will come out on top. Capcom is turning to their well established Devil May Cry formula when it is released today, and Konami has got the hype machine turned up for their action packed makeover to the Metal Gear Solid series with Metal Gear Rising: Revengeance. If only these two games were what they really seemed on the surface. It's great to see such a classic match up going toe to toe like they used to back in the NES and SNES days, but the intrigue and drama which defines the relationship between these two titles is far deeper than a typical nostalgia grudge match. Let's start off with the basics. Capcom turned over development rights to Ninja Theory in a controversial move which still has longtime fans fuming to this day. Tasking them with rebooting the series into what is now known as DmC Devil May Cry, Ninja Theory has apparently risen to meet the occasion as early impressions of the game have been nothing but positive. Why did Capcom turn their biggest hack 'n slash series over to an outside Western developer, though? Could it be they truly lost vision with the appalling narrative pile known as Devil May Cry 4, or could it have something to do with the series' personnel not being available anymore? For the sake of a good story, we'll go with the latter. Devil May Cry 2, 3 and 4 director Hideaki Itsuno has been reassigned to work on the fledgling Dragon's Dogma series, but we're not referring to him as the go to guy best for the job. After all, only one of his games in the series is well regarded. No, we're talking about Hideki Kamiya and Shinji Mikami, the duo who created the series in the first place after it proved to be too much fun to be a Resident Evil game. Where are they and why aren't they working on this series instead? Well, it's almost common knowledge that these guys left Capcom in 2006 when their promising Clover Studio was cut for budgeting reasons. It's also well known that these guys formed what is now known today as Platinum Games and have been busy re-establishing Japanese action titles as an important genre of video games. Their 2010 hit Bayonetta scored almost universal praise, and its creator, Hideki Kamiya, is the very same guy who created Devil May Cry. Kamiya has made it no secret he's no longer a fan of Capcom, especially after they removed his name from the credits of his Wii version of his brain child, Okami. Now, his company is working in tandem with Capcom's long time rival, Konami, and Platinum Games just might have their first huge commercial hit on their hands as well. Platinum Games is about to unleash Metal Gear Rising: Revengeance. With the experience they've taken from working on both Devil May Cry and Bayonetta, many of the designers are ready to prop up Konami in this strange fight between the old creators of Devil May Cry and the inheritors of the series. It's two classic series created by two classic gaming companies, only the development teams have jumped sides. The up and coming guys find themselves pitted against the genre's seasoned vets, and nobody really knows who's working for anybody anymore. It's a total mess just waiting to unravel, really, and the tension is so thick, you can cut it with a flaming blue demonic sword. The only real question is where do you, the fans, stand? Do you stand with Ninja Theory and Capcom, further attempting to rewrite the boundaries between Japan and Western video games with the reboot of the Devil May Cry series? Or, do Konami and Platinum Games have your attention with a handful of extremely talented and rebellious game developers looking to stick it to the guys who tossed them aside. Of course, you also live in a world where all of this nonsensical rivalry doesn't mean anything except better games for you, thanks to the magic of competition. Who says you'll need just one? I'll be picking up both somewhere down the line, but I'm going to lean towards Konami in this case. I've played the demos for both, and they are a lot of fun. All I really have to go on is track record, and quite frankly, Platinum Games and their staff's legacy blows Ninja Theory out of the water.